Spurred by increasing business development like Amazon’s new fulfillment center, Spokane County’s largest road project in 2019 includes new roundabouts, a pedestrian trail and an extra lane. But the redesign of Geiger Boulevard is far from the only large road project the county is building this year. The Geiger project on the West Plains, which will cost $44 million, will break ground this spring. The boulevard will be upgraded from two to three traffic lanes, with a center turn lane and 10-foot shared use path connecting to new commercial and industrial development along the corridor. Plans also call for a new traffic signal at Geiger Boulevard and Hayford Road, as well as construction of three roundabouts to replace signalized intersections at the Medical Lake freeway interchanges. An additional roundabout will be constructed at Aero and Westbow roads, and a new parallel bridge will be built across Interstate 90 at the Medical Lake exit, providing additional travel lanes and a shared-use path. The county will install water, sewer and fiber utilities as well as bus stops at major intersections along Geiger Boulevard to serve commercial developments. The Geiger Boulevard improvements will be phased in over two years and funded by a $14.3 million federal transportation grant awarded to the county last year, as well as more than $28 million from the state Department of Transportation, the city of Spokane, the West Plains Public Development Authority and the Spokane Transit Authority. Phase two of the project in 2020 includes expansion of traffic lanes on the eastern section of Geiger Boulevard and construction of roundabouts at the Grove Road freeway interchanges. The county estimated the current configuration of Geiger Boulevard would fail if traffic – especially heavy truck activity – increases. And heavy truck traffic surely will increase with the opening of the Amazon fulfillment center in the fall, supporting 1,500 new jobs. The improvements also were spurred by land-use planning efforts around Geiger Boulevard and near Spokane International Airport. The county plans for an additional $26.5 million in capital improvement projects, such as pavement replacement at Hawthorne Road from Nevada Street to Parksmith Road and Country Homes Boulevard from Cedar Road to Wall Street. The projects will begin in May or June and take three weeks to complete. Construction on the next phase of the Bigelow Gulch-Forker Road corridor, which includes a 3-mile stretch from Argonne Road to the interchange at Bigelow Gulch and Forker roads, will begin in May. The $9.7 million project will take six months to complete and periodically require flaggers, as well as detours during construction. 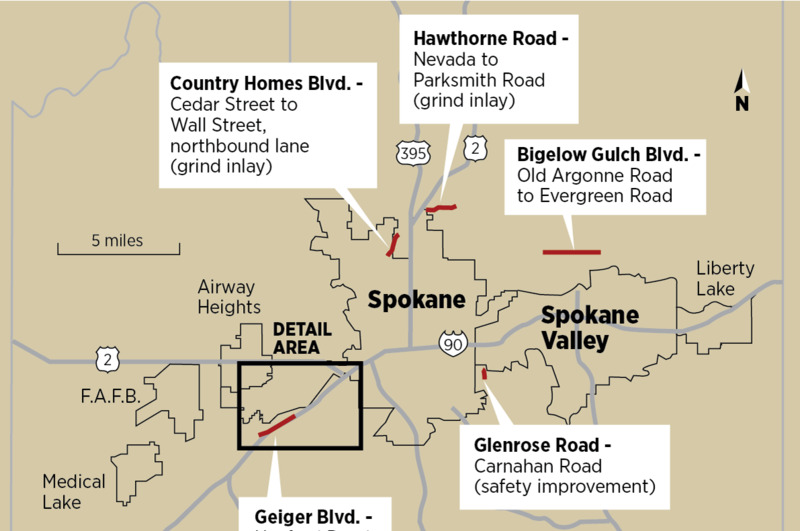 It’s one of six significant phases in the $68 million Bigelow Gulch-Forker Road Urban Connector project to improve safety and reduce congestion from the North Spokane Corridor to Spokane Valley. A third county road project calls for construction of a roundabout at Glenrose and Carnahan roads to improve safety; it is expected to begin in April and be completed within three months. This year, there have been severe car crashes resulting in property damage and a fatality at Glenrose and Carnahan, said Spokane County Commissioner Mary Kuney. Published: Feb. 11, 2019, 5 a.m.